Monthly Recurring Revenue (MRR) is by many regarded as the lifeblood of a subscription-based business. But, even though nearly every web hosting service is offered in a subscription model, not all companies are fully aware of the significance that this report has, or how to scale its figures up. For a SaaS business, it is usually the only thing that people at the top are interested in. It is basing on MRR that you can calculate other powerful metrics defining the general condition of your business, including the Average Revenue Per User (ARPU), Customer Lifetime Value or Revenue Churn. Why is not MRR used more often by web hosting businesses then? For smaller companies, the way this metric is calculated may not be simple enough, plus the most common billing tools do not include it as a standard report. A web hosting business is also typically more complex, and provides a variety of services that are not easy to measure either. With MetricsCube, web hosting companies get easy access to monitor MRR in their WHMCS. Why is MRR so important? Offering services and products in a subscription business model implies certain behaviors and rules that do not exist in the realms of traditional sales. Once a new customer is acquired, they generate an ongoing recurring revenue which is a foundation for the entire company. MRR defines, in a simple way, what monthly recurring income you can expect from the current, active subscriptions. In other words, every subscription business should focus on increasing MRR to grow its bottom line. The higher the MRR, the better the condition of a company and the higher its value. 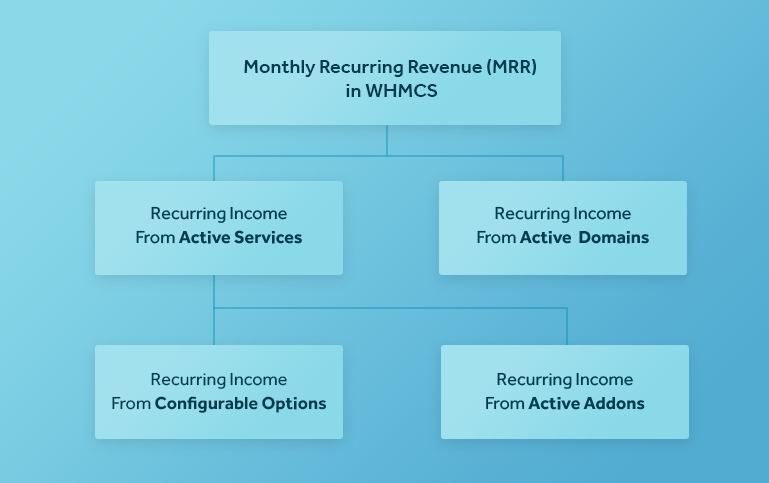 What does Monthly Recurring Revenue consist of in WHMCS? Since there are multiple items in WHMCS that customers can pay recurrently for, MRR must take all of them into account. These are domains, services, addons and configurable options. What is more, MRR is calculated based on the value of paid invoices only, and includes all applied discounts. What else should you know about MRR? Its value increases when new clients are acquired, as soon as they buy extra services or upgrade their plans. If a subscription is not paid monthly, it is divided by the number of months it covers – e.g. MRR of an annual subscription is simply one-twelfth of a yearly fee. Its value decreases when clients cancel their services or downgrade plans. It does not include one-time payments. Decline of MRR is called Revenue Churn and there is a separate report for it. It is important to monitor Revenue Churn to minimize the MRR loss. MRR does not include ongoing costs, therefore a high MRR does not necessarily mean high profits of a company. It must be considered as a relative metric. Increasing MRR is one of the most important goals of a subscription-based business, but generating new sales is not the only method to do it. We will be posting ideas for web hosting companies about how to increase MRR in further Blog posts. I wish there was a way to remove domain names from MRR. Indeed the MRR report includes all the products, addons and domains together. However, there is an easy way to filter the report by products or product groups. Have you tried to use it? Wouldn’t it be the solution here for you?